Gone are the days when your garage needed to be a dark, dusty, and oil-stained space for parking your car. Garages today are more often used in many ways, including storage, hobbies, and even home fitness centers. A polished concrete garage floor is a great way to maintain the concrete look but with a bright, mirror finish that makes your garage seem brighter and even cleaner. With decorative concrete stains and saw cutting, you can even achieve a colorful custom look that will make your garage the envy of the neighborhood. Don’t settle for boring and dusty; concrete polishing service in Houston is an affordable way to transform your garage with a practical and decorative floor system. We take pride in delivering superior concrete solutions to fit your needs and budget. Ready to see the possibilities of your garage with a beautiful polished concrete garage floor? Give us a call! Concrete polishing in Houston, TX isn’t as straightforward as it may seem. The process requires more than buffing the bare concrete floor to add a shine. Concrete grinding and polishing is a multi-step process that begins with repairs followed by grinding, honing, and polishing. The first stage of concrete polishing begins with a 16 grit diamond disc. Progressively finer discs are used up to a 150 grit disc or finer. As the discs get finer, tiny grooves and scratches from the previous disc are removed to create a progressively finer surface. Our concrete grinding and polishing contractors will determine which grits to use based on the condition of the concrete, whether it has existing coatings, whether there are waves that need to be leveled, and if you want any aggregate in the concrete exposed. This grinding process doesn’t just make the concrete smoother; it opens the concrete’s pores. After the last stage of grinding, a liquid densifying chemical is applied. This hardens the surface of the concrete and helps reduce water penetration and staining. The next stage is honing which uses resin-bonded diamond discs. Honing will give your polished concrete garage floor a satin sheen that will slowly begin to hold a shine. Honing will continue up to an 800 grit disc. If you want a decorative color, we will add concrete stains at this point. Finally, concrete polishing begins. The polishing stage continues until we reach a 1500 or 3000 grit diamond disc. The higher the grit, the greater the polish. Depending on how far the honing and polishing continues, we can achieve a range of decorative effects. With a level 1 gloss below a 100 grit disc, your concrete will have a flat appearance. Level 2 achieves a matte or satin look with low sheen. We can continue up to a level 4 which achieves a mirror-like shine that almost looks wet. There’s a lot to like about polished concrete. This cost-effective concrete resurfacing solution can finally give you a garage you’ll want to spend time in! 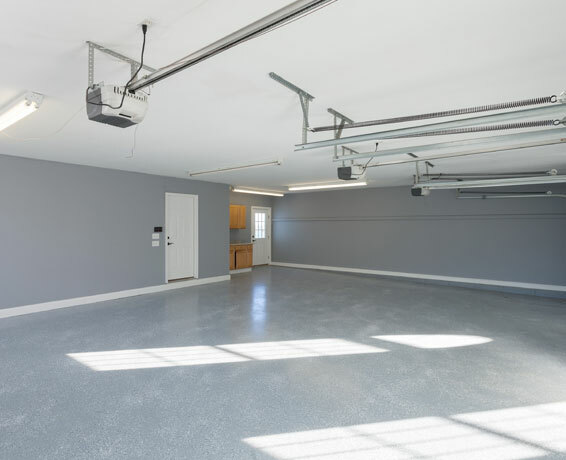 Our Houston concrete polishing service is a cost-effective and permanent solution to transform your garage into a bright, clean space you’ll actually want to show off. A polished concrete garage floor in Houston is better able to resist stains and damage than unfinished concrete and it’s easy to customize. We can incorporate concrete stains and saw cutting for custom colors and patterns or you can leave the concrete gray but choose your level of sheen. 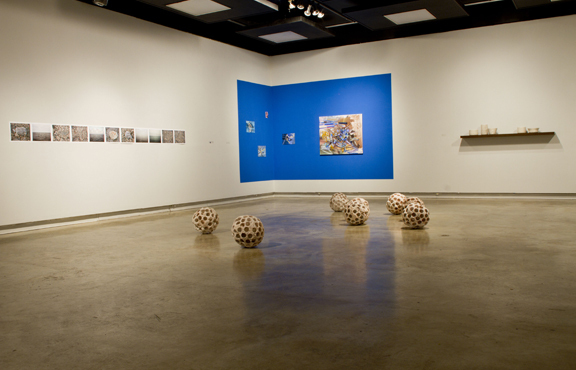 Polished concrete is a waterproof floor system that won’t be damaged by water. The polishing process uses a densifying chemical that hardens the surface of your concrete to make it less porous and better able to resist stains. Best of all, the surface becomes highly reflective to make your garage seem larger and more open without extra lighting.